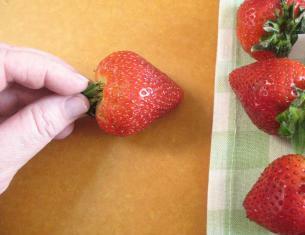 Strawberries, once just a summertime treat, are now available year round. Especially tasty are the locally grown ones that are now showing up at farmers’ markets. 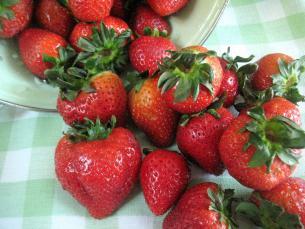 Always choose strawberries that are plump, firm and glossy. Wash them just before using them. 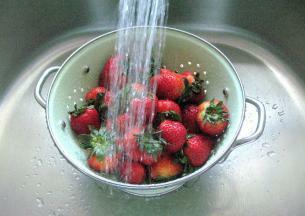 I always wash my supermarket strawberries, in a colander, under a gentle spray of running water. Or you can swish the strawberries around in a bowl with cool tap water. 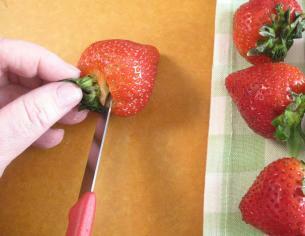 Once washed, spread the strawberries out on a clean dish towel to dry. 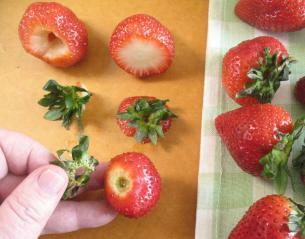 To “hull” a strawberry means to remove the green leafy top and the tiny stalk. If you plan on hulling tons of strawberries, you may want to buy a strawberry huller. But a small paring knife works very well for hulling a quart or two. 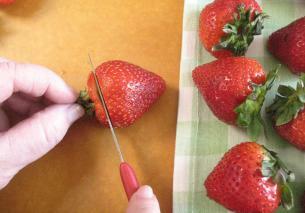 …and just trim out that tiny stem. Or you could just slice off the whole top with a small paring knife. Just pulling off the green leafy top (as shown below) is NOT enough. You need to remove that tiny bit of white, hard stem as well. To store strawberries, place them in a single layer in a moisture-proof plastic container that has a tight fitting lid. 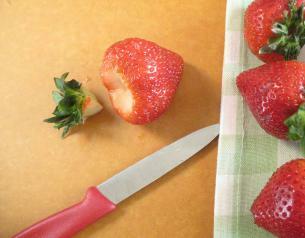 Lay a paper towel on top of the strawberries and then put the lid on the container. When you put them in the refrigerator, store them with the lid side down in the refrigerator. Stored this way they should stay fresh for at least 2-3 days. Strawberry Short Cake – a classic that everybody loves! Hello from New York! Very good tips. I love strawberry shortcake. Strawberries taste so good. 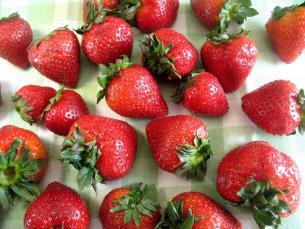 Strawberries are a power food with a great source of Vitamin C and you are right, they taste soooo good. I love strawberries! They are so delicious! And this time of the year, strawberries are so overflowing. Thanks for the tips!